The Mother of Woodstock, Linda Kornfeld. Artie and Linda Kornfeld, with Michael Lang. 1969 Woodstock Music and Art Fair. It was 1969, the Kornfelds had Michael Lang staying with them. The three were having a discussion about the truth and love of music, as payola and crookedness had begun. Artie said let’s have a concert for music and love, Linda said it had to be outside where people felt free, and Michael agreed. I am writing this out to pay homage to Linda Kornfeld. Today we have Artie and Michael on two sides of a story, one for love, one for rock glory. Linda is never mentioned publicly, yet as all the women in the world know, we help hold and support the things in our lives together. Support the growth, make sure we keep our cool, and see things through. 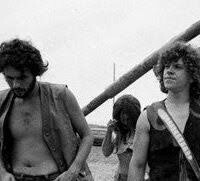 Artie Kornfeld, Linda Kornfeld and Michael Lang 1969 Woodstock Music and Art Fair. Here is the link to The Spirit of the Woodstock Nation, a congratulation song for those who did not sell out, and for those of us who still live in love. Crafted over 13 years of memories, vision, peace, love, music, friendship, hopes, dreams, and hard work. Love is who we are. To women everywhere. To Linda.. we are rising.